Siegling Extremultus high-efficiency flat belts are characterized by their long service lives, highly uniform RPM speeds, high effectiveness > 98% and good damping properties. Several shafts can be driven simultaneously in the same and opposite directions. 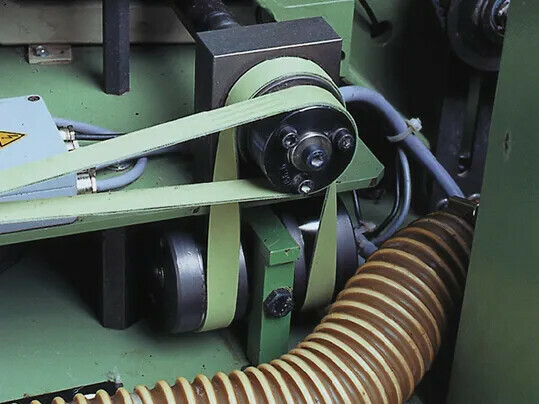 Furthermore, Siegling Extremultus power transmission belts can be turned at an angle to the axis of the running direction (mule drive) and are also suitable for use on conical pulleys (taper-cone drive). Siegling Extremultus high-efficiency flat belts of the P line are available with friction coatings/coverings of highly wear-resistant elastomer G or chrome-tanned leather on both sides. The polyamide tension member is characterized by its good elastic property/ behaviour, which dampens impacts and oscillations. The elastomer G friction coating is used for all standard drives in carding machines, drawing frames, fan and main drive belts for spinning frames and twister operating under dry or dusty conditions. The chrome leather L friction coating is used for all standard drives in carding machines, drawing frames, flyer spinning frames and for main and secondary drive belts in twister and texturing machines, especially where oil and grease factors play a role. On taper-cone drives the belt can be shifted easily thanks to its particularly stiff edges and the good sliding and wear properties of the chrome leather friction covering. Siegling Extremultus high-efficiency flat belts of the innovative E line have highly wear-resistant friction coatings of elastomer G on both faces and are well suited for use on either simple two-pulley drives or multiple-pulley drives. Various polyester tension members and a large operational elongation range of 1.0 – 2.5% make individual power transmission possible by appropriate selection of elongation at fitting. 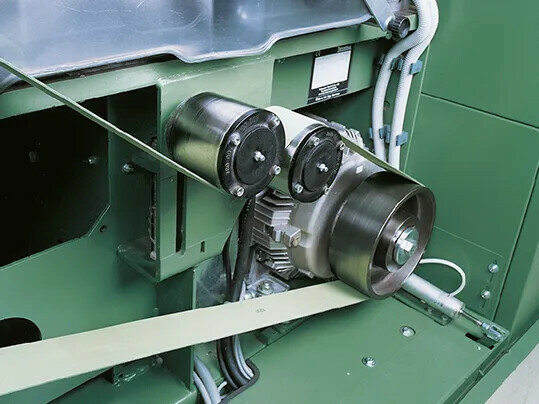 The flexible belt construction makes the Siegling Extremultus E line a universal drive belt, in particular for mule or torsional drives and for applications with small pulley diameters. The symmetrical belt design and the smooth Z-splice ensure exact belt tracking with minimal angular velocity oscillation. The thermoplastic, flexible tension member helps save energy and is also largely unaffected by fluctuations in ambient conditions, ensuring no maintenance.